If you want to help make a difference to the environment, this is a great place to start. In 1995, the ARC Campaign was started to help reduce our waste stream and create Australian jobs by encouraging more manufacturers to use this kind of packaging, rather than virgin cartonboard. 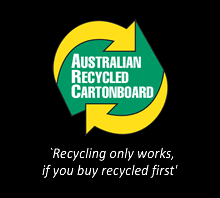 The Campaign started with a national school's competition, requiring students to create a logo (the ARC logo) that could be applied to all products packaged in Australian Recycled Cartonboard. The success of the Campaign to promote its use, has been so great, we can now also use other forms of recyclable Australian Recycled Packaging, in particular, glass and aluminium. Products with this packaging can be easily identified by them bearing the ARP logo.